The products range from amplifiers and speakers used in foreground and background music systems, to mixers, wireless microphone systems and digital processors used in sound reinforcement, to integrated intercom systems for security and communications. It is a leader in the application of digital technology to professional audio equipment, including sophisticated evacuation & general public address system. 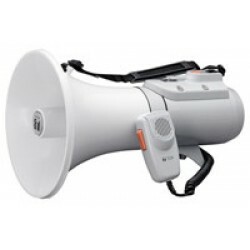 ZR-1015 TOA MegaphonesThe ZR-1015 is an easy-to-operate, hand grip type megaphone rated at 15 W of o..
ZR-1015S TOA megaphonesThe ZR-1015S is a hand grip type, 15 W output megaphone with a siren. Pressin..
ZR-2015S TOA MegaphonesOutput : Rated 15WPower Source : 9V DC R14P (SUM-2) or “C” Batterie..
ZR-2015W TOA MegaphonesOutput : Rated 15WPower Source : 9V DC R14P (SUM-2) or “C” Batterie..
ZR-510 TOA MegaphonesSmall in size and light in weight, the ZR-510 megaphone can be easily carried b..
ZR-510S TOA megaphonesSmall in size and light in weight, the ZR-510S megaphone can be easily carried..
ZR-510W TOA MegaphonesSmall in size and light in weight, the ZR-510W megaphone can be easily carried..